Twice I’ve touched on looping constructs. Twice I haven’t talked about them. In this post I explore the different looping constructs available in Action! Now I’ll look at how each one is constructed and works. A WHILE loop is constructed using the WHILE statement followed by a conditional, then the DO OD block. Embed the statements you want looped inside the DO OD block. With the WHILE loop, statements within the loop may not execute at all if the condition is already met when the loop is executed. For example, if the condition is x<5, and x=10 at the loop start, the loop won’t be executed because the condition has not been met. An UNTIL loop is constructed a little differently. The UNTIL statement is placed just before the loops closing OD. UNTIL also requires a condition to be met. The biggest difference in execute between UNTIL and WHILE is the statements in the UNTIL loop will aways be execute at least one time. For example, if the condition is x<5 and x=10 at the loop start, the loop will execute once, see the condition has not been met, then exit. The FOR loop provides a little more control over the loops execution, mainly in how many times the loop is executed. With WHILE and UNTIL the loop is repeated until a condition is met, which may or may not be a set number of iterations. With FOR, the loops is executed a set number of iterations. You can also control the loop stepping. In all of the FOR contracts above, n1 represents the starting number; n2 represents the ending number; and n3 represents the step rate. If you want to repeat a loop forever you can do that too, easily. Just omit the WHILE, UNTIL or FOR completely. The begin and end looping constructs used alone will loop indefinitely. This can be useful to repeat a game loop for instance (check stick movement, check collision, update score, repeat). Help, I’ve started a loop and can’t get out! Never fear, you can use the EXIT statement to exit the currently executing loop construct without meeting the terminating condition. 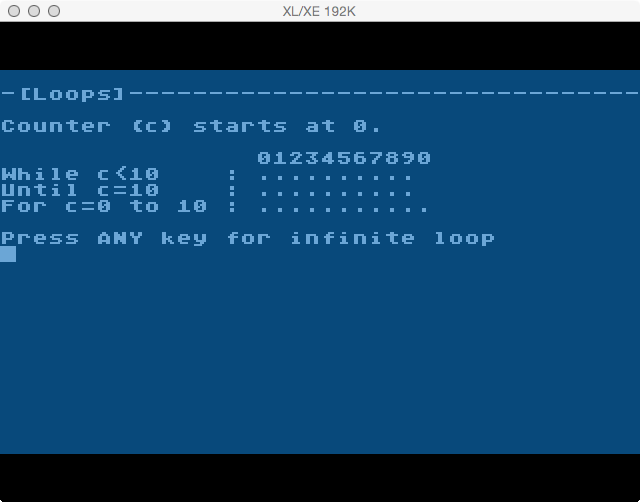 Here is a small program written to demonstrate the looping constructs. The FOR loop. The counter does not need to be reset. It is initialized to the start value (0) at the loop start. The loop will execute until the counter equals 10 (in other words 0 through 10 – yes 11 times). Inside the loop statements a “.” is printed. Following the loop end, and EOL is printed. This tells the user it is about to start the infinite loop, then gets a keystroke which essentially pauses until the user responds. This is done because the printing from inside the infinite loop will eventually push the existing text off the screen as it fills up. The GetD(7) statement is used to get a byte from device 7 which is the keyboard. The Infinite loop. There are no conditions here. The loop will execute forever. Inside the loop statements a “.” is printed. This exits the program, though it will never be reached due to the infinite loop immediately prior. Next I’ll start looking at file I/O. Here I explore using and passing pointers in Action! 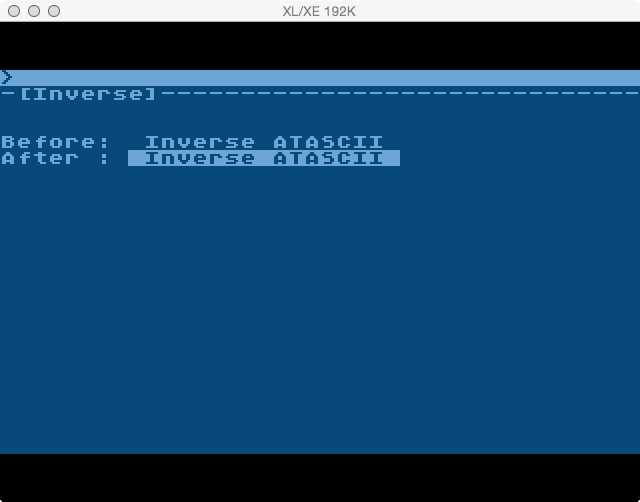 To do so I wrote a program to inverse a string. Inverse as in reverse video, not reverse character order. I created a procedure called StrInv that takes one parameter which is the string. It inverses it without creating a new string and returns. The main routine simply assigns the initial string value, prints it, calls the StrInv procedure, then prints the string again. I’ll break down the code first, then present the complete listing last. 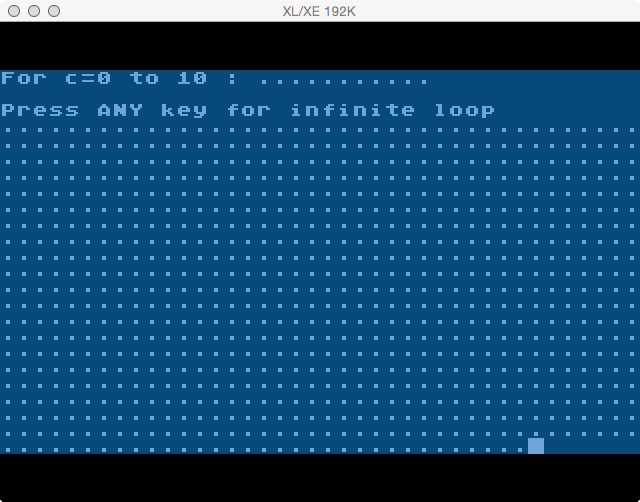 CHAR ARRAY sStr(17)=" Inverse ATASCII "
Next I’ll cover various loop constructs since I’ve just hit on the for loop. In this post I explore the Action! input routines. Just as there are many ways to output to the screen in Action!, there are also many ways to input in Action! There are several flavors of the Input procedure. There are versions specific to each data types. InputB – Inputs byte value. Range is 0 to 255. Returns the input value. InputC – Inputs card value. Range is 0 to 65536. Returns the input value. InputI – Intputs integer value. Range is -32768 to 32767. Returns the input value. InputS – Inputs string (char array) value. String pointer is passed to function. String is modified directly. One thing I left out in both Input and Print are the variants for device access. I’ll cover those later when I start exploring file I/O. Here is a short program that demonstrates each variant, with a breakdown. The complete un-interrupted source will be presented at the end. This program is based on the print program presented in the previous post “Action! Print and Put“. I will only breakdown the input parts in this post. Here I declare a variable of each type and initialize their values, unlike the print program this initializes all variables to zero and null for the string. This is the start of the main procedure. Every Action! program must have at least one procedure. This is the same as the print program, listed here so you can see where changes are occurring. This prints a section header on the display with an EOL. I use Print to display the input prompt showing the range of allowed values. No EOL is output since I don’t want the cursor returned to the next line yet. This is for the BYTE value. Again I use Print to display the input prompt showing the range of allowed values. No EOL is output since I don’t want the cursor returned to the next line yet. This is for the CARD value. For display purposes the range starts at 256, but in reality it’s 0. Again I use Print to display the input prompt showing the range of allowed values. No EOL is output since I don’t want the cursor returned to the next line yet. This is for the INT value. And last I use Print to display the string input prompt showing the length allowed. An EOL is output since I want the cursor returned to the next. This is for the STRING (CHAR ARRAY) value. Notice the call is slightly different. The value is not returned from the input function, the variable is modified directly (passed as a pointer). Thats all for the changes, barring a PutE() before the Print Examples. This is slightly out of order as it should have been before the last post, but here it is. There are many ways to output to the screen in Action!. There are several flavors of the Print procedure. There are versions specific to data types, and then there is a version that can handle multiple data types. On top of that, there are variants for outputting with and without an EOL (end of line). In addition to Print there is also a Put procedure. PrintF – Outputs multiple value types with or without EOL. Short for formatted output. Here is a short program that demonstrates each variant, with a breakdown. The complete un-interrupted source will be presented at the end. First we declare a new module. The MODULE directive tells the compiler that global variables follow. For simple programs this can be omitted as the compiler will implicitly define one if it is not found. Here I declare a variable of each type and initialize their values. Note that CHAR and BYTE can be interchanged. bChar is set to 65 which is the value of letter A. This is the start of the main procedure. Every Action! program must have at least one procedure. This first example uses PrintE. This prints a character string followed by an EOL. Next I use Print to display the text “Byte : “. No EOL is output since I don’t want the cursor returned to the next line yet. Here I use PrintBE to display the byte in variable bVal, and follow it with an EOL. Now I use Print again to display ” : “, again no EOL. 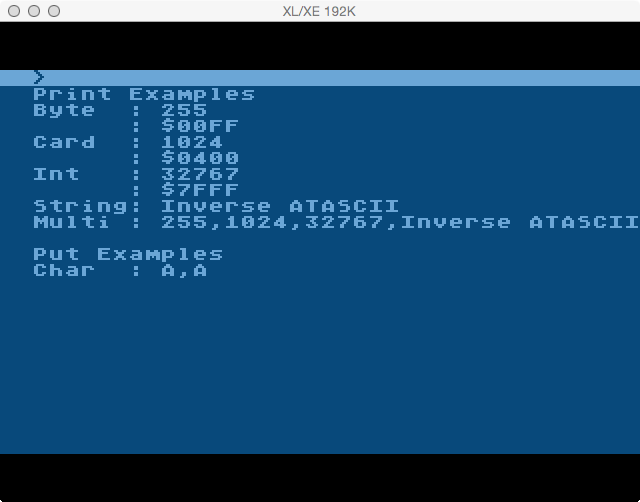 And last I use PrintF to display formatted output. In this case I use %H to tell PrintF to display the hexadecimal value of the bVal variable. I also specified %E to tell it to output an EOL. 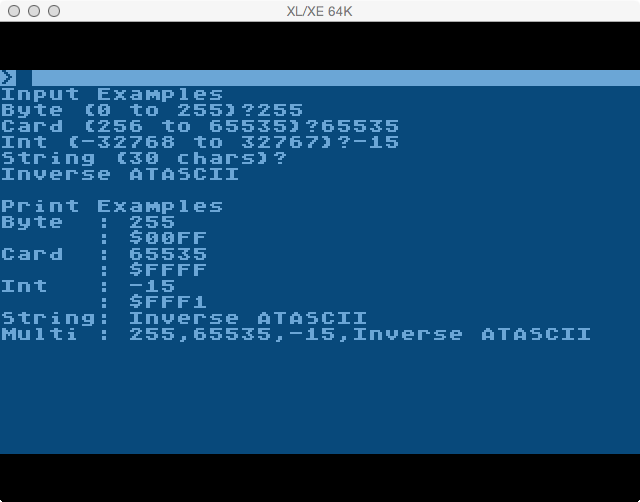 Similar to the byte output above, this section does the same for a CARD (2 byte) value. Similar again, this section does the same for an INT value. Now I’ll use Print and PrintE to output a label for the line and the value of the character array sVal followed by an EOL. This section demonstrates PrintF’s power by displaying all of the values above on one line. %B is used to display a BYTE value. %U is used to display a CARD value. %I is used to display an INT value. %S is used to display a character array (string). And %E is use to output an EOL. Now that Print has been covered, there is another output command called Put. It also has a variant called PutE. However the PutE variant does not take any variables. PutE sole purpose is to output an EOL. First I use PrintE to display a section header for the output. I use Put to display the character value of bChar. This just outputs a seperator. 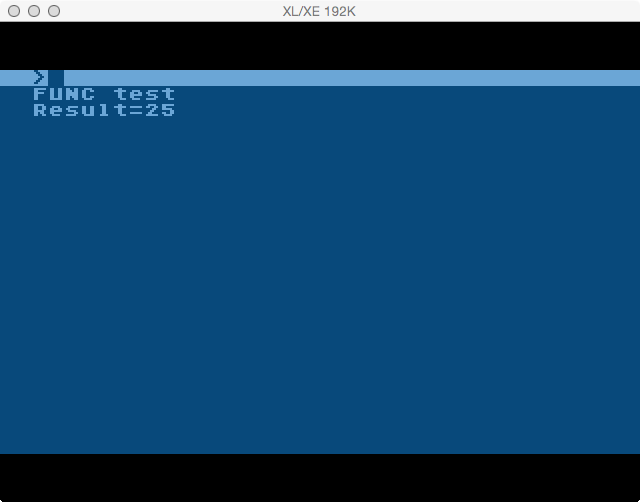 Now I output the character again, and then use PutE to output an EOL. End of the program main procedure. Next I’ll look at Input. 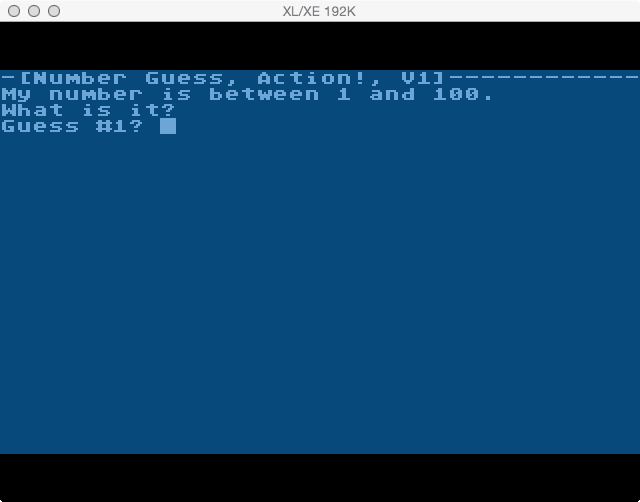 I’ve now worked out the zero padding for the guess number and now the game looks and plays identically to the BASIC and Assembly versions I wrote. 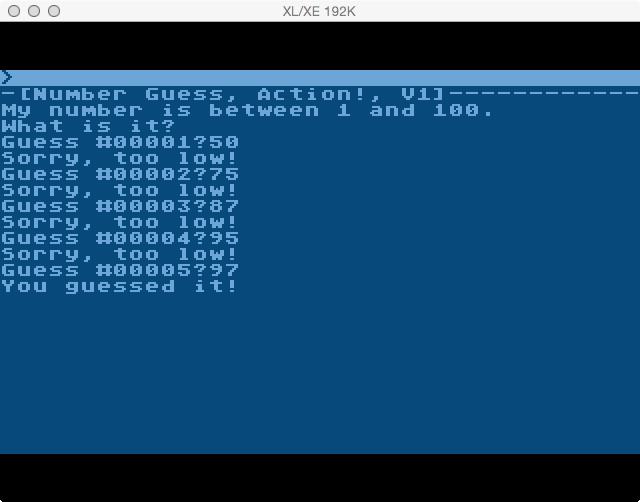 As I presented in BASIC and in Assembly, here I created a Guess My Number game. 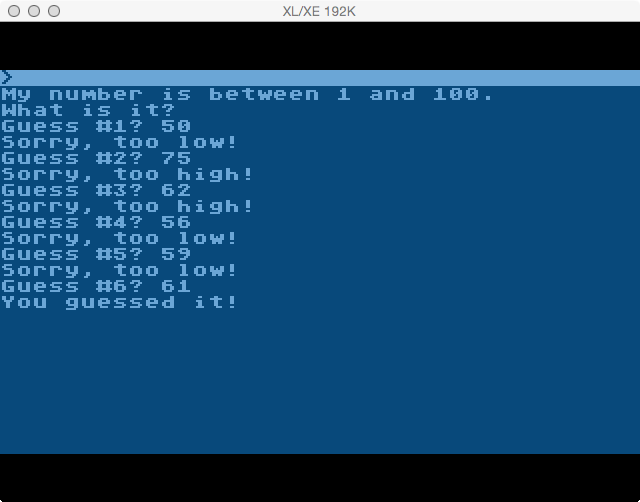 This game generates a random number between 1 and 100 and asks the user to guess it. There isn’t a limit to the number of guesses. It looks and behaves just like the other two versions I created – with one minor exception. The only difference is in the display of the guess number. In this Action! 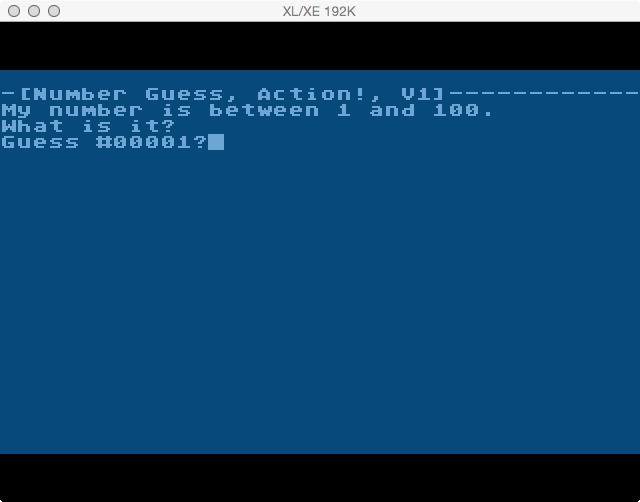 version, the guess number does not have the 0 padded five digit number. I need to re-learn the string manipulation routines Action! has to offer. I commented the source family well, but I’ll break it down by section since Action! does not use line numbers. gsnum as type BYTE and initializes it to 1. This is to keep track of the guess number. iguess as type BYTE and initializes it to 0. This is where the users input is stored. mynum as type BYTE. This is the secret number the user is trying to guess. lmarg as BYTE initialized to point at memory location 82 (decimal) which is the left margin. 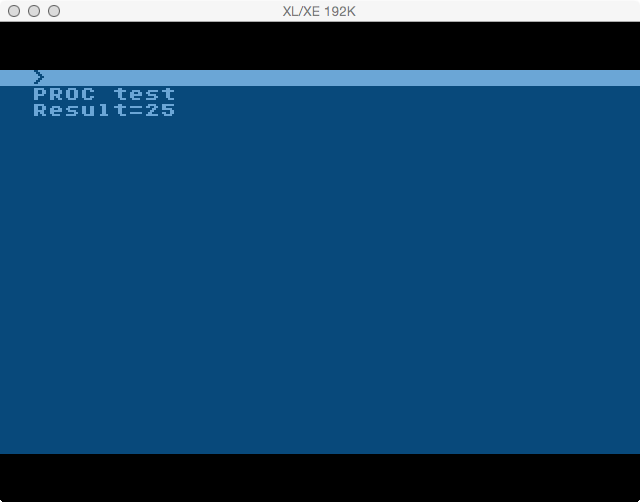 lmarg=0 puts a 0 in the memory location pointed to by lmarg, which is 82, effectively setting the left margin to 0 instead 0f default 2.
graphics(0) resets the text display, effectively clearing the screen. There is probably a better way to do this, and I will look into it further. I couldn’t get character 125 to clear the screen using any print combination. mynum is assigned to the result of the rand() function passed with 100 which will return a number between 0 and 99, so 1 is added to the result to get a number between 1 and 100. This just prints the header for the game. The lines using “print” do not add an EOL to the end of the string thus leaving the cursor at its location. The lines using “printe” do add an EOL to the end of the string thus moving the cursor to the next line. This creates the program guess loop. Everything between “do” and “od” are repeated until an exit condition is satisfied. The exit condition is specified by the “until” statement which says that the users guess must equal the secret number (“iguess=mynum”). Printing “Guess #” without EOL (print). Printing the guess number as a byte (printb), again without EOL. Printing the ? prompt without EOL. Use the inputb function to get a byte value from the user. Simple enough. If the users guess is less than the secret number then print “Sorry, too low!” with EOL. Again, simple. If the users guess is higher than the secret number then print “Sorry, too high!” with EOL. Again, simple. Since neither condition prior matched, this else catches the only other condition – equal. Print “You guessed it!” with EOL, then force an exit of the DO loop. I’m not sure the exit is required since the values will be the same and satisfy the loop exit condition. Then a RETURN to signal the procedure Main end. Before the program can be run, it has to be compiled. Enter the Action! Monitor. Then enter “C” to compile. If there were no errors, enter “R” to run it. Action! programs can be compiled with a runtime so the cartridge is not needed. I’ll explore that in a later post. In the next post I will have the 0 padded guess number.